“This is a truly great Holmes story! Kudos are given for the remarkable final reveal. I found the book to be fast paced but the characters very well developed. Action adventure, mystery and a hint of a ghost story combine to create a tale well worth the reading! 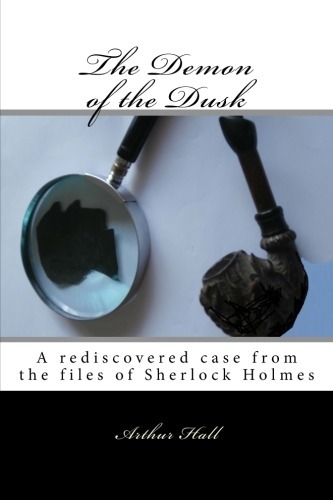 The Demon of the Dusk: The rediscovered cases of Sherlock Holmes Book 1 is available from all good bookstores including The Strand Magazine, Amazon USA, Amazon UK, Waterstones UK and for free shipping worldwide Book Depository. In ebook format it is in Kindle, Kobo, Nook and Apple iBooks (iPad/iPhone). East meets West as one of the most talented British Sherlockian scholars, John Hall and a Japanese member of the Baker Street Irregulars, Hirayama Yuichi argue important Sherlockian questions. One offers the other three questions, and the other answers them with all their Sherlockian knowledge. They are serious Sherlockian battles between an English Knight and Japanese samurai! This volume also includes Hirayama’s Sherlockian papers published in The Musgraves, The Baker Street Journal, The Canadian Holmes and The Shoso-in Bulletin. “ Excellent book of Sherlockian studies written by a Japanese Holmesian / Sherlockian Hirayma Yuichi, a member of the famous American society The Baker Street Irregulars called “A Japanese Vase” among them, Japanese Sherlock Holmes Club, Sherlock Holmes Society of London and several other societies of the same specialization. Mr Hirayma met with Sherlock Holmes when he was eight, ie. several decades ago. Then he found thick volumes of Japanese children’s adaptations of the stories of the famous detective. And since that time lasts his devotion. I appreciate Mr Hirayma’s broad culture knowledge and fondness for classic detective stories applied on Japanese milieu. As well as his patriotism that I like, too. As a non-native English-speaker (which I am too) he indicates our common problems – we like Sherlock Holmes, Victorian England, English language and way of life, but must inevitably cross the language barrier during our reading and writing studies. East Wind Coming is available from all good bookstores worldwide including in the USA Amazon and Barnes and Noble, in the UK Amazon, Waterstones . Fans outside the US and UK can get free delivery from Book Depository. In ebook format it is in Amazon Kindle, Kobo, Nook and Apple iBooks(iPad/iPhone). The MX Book of New Sherlock Holmes Stories is the largest collection of new, traditional Sherlock Holmes stories ever compiled. Already with six volumes (volumes VII, VIII and IX are underway) and now over 100 of the world’s leading authors taking part the collection is going from strength to strength. All the authors are donating their royalties to Stepping Stones School at Undershaw. Here’s author Arthur Hall whose stories appear in Volumes IV, V and VI. Arthur is also the author of The Demon of the Dusk .